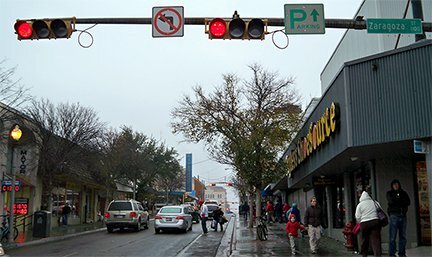 ​US 81 was alone in Laredo for only a few years: the US 83 designation was extended through town in 1931. It came in from the north twinned with US 81 along San Bernardo. At Matamoros, where US 81 turned west, US 83 went east. 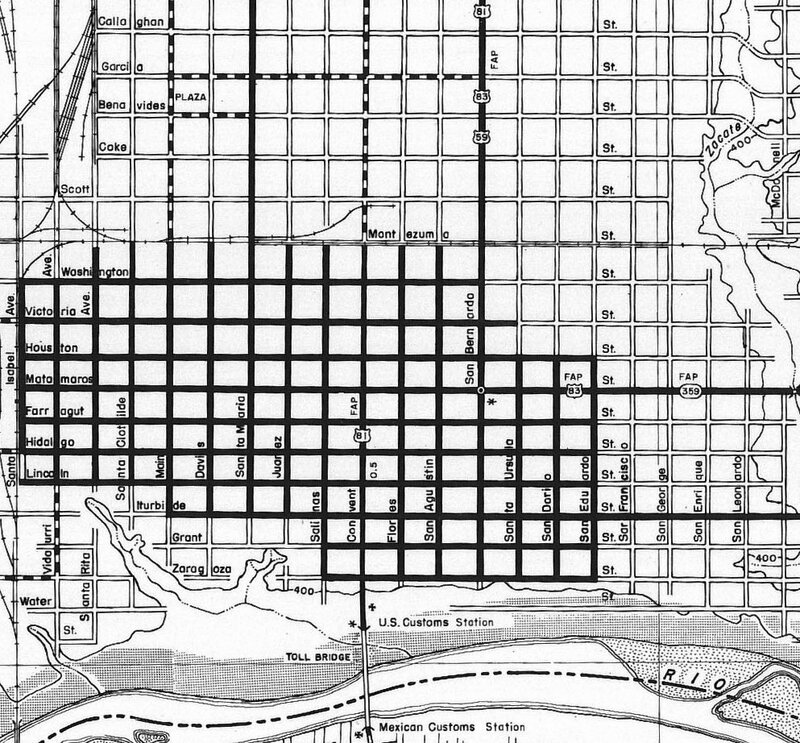 At the time, Matamoros carried both east and westbound traffic, and on the east side of Zacata Creek, Matamoros became Guadalupe Street. It is likely that US 83 was originally directed south on Meadow Avenue, which eventually connects with the current alignment of US 83. ​For the first few years, US 96[i] went south from Alice to McAllen, and ended in Brownsville. But in 1934, the US 96 designation was changed such that, from Alice, it followed what is now TX hwy. 359 through Hebbronville, ending in Laredo. It would have come into town on Guadalupe, potentially ending at Meadow, where it junctioned with US 83. However, I suspect US 96 did not actually end at that intersection. Rather, I believe it would have been twinned with US 83 to San Bernardo, ending at its junction with US 81. A third possibility is that US 96 could have been co-signed with US 81 down to the Convent Bridge, but I do not believe that was the case either (for reasons outlined below). US 59 came in from the north and east via Saunders and Lafayette streets (off the north edge of that map). But the US 59 designation was shown to extend south along San Bernardo, with US 81 and US 83. US 59 clearly went as far as Matamoros, but the map contains no evidence that it went any further than that. That map also serves as the reference for my opinion that neither US 96 nor US 59 were ever signed all the way to the border crossing. 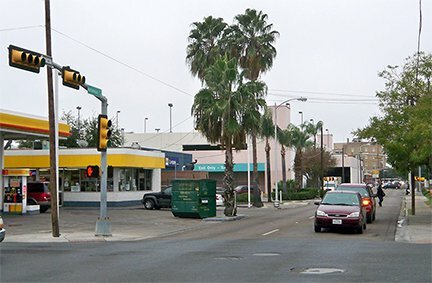 TX 359 was the replacement designation for the original Laredo routing of US 59, and the fact that 359 is shown ending on Matamoros at San Bernardo leads me to believe that its predecessors ended there as well. 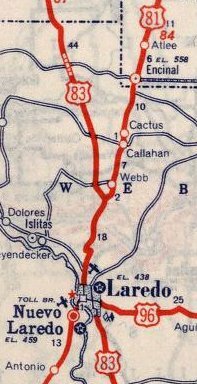 According to the 1965 USGS topos, I-35 had been extended into Laredo within a few years after the map shown above. 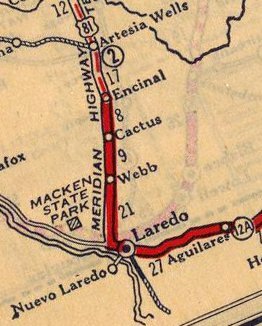 At that time, it appears that US 81-83 traffic was redirected onto the new freeway, while San Bernardo was redesignated as Business 81-83. I am assuming that is when the US 59 designation was truncated to its next endpoint (on Lafayette at I-35). Despite the existence of I-35, Mexico-bound traffic still had to jog over to the Convent bridge until 1976. That year, the Juarez-Lincoln International Bridge was opened. This bridge, at the foot of San Dario Avenue, is more commonly known as simply “Bridge #2”. However, according to TXDoT insets of Laredo, US 81 traffic was never redirected to this newer border crossing. 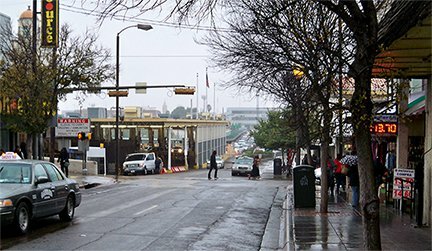 Instead, drivers continued to be directed to the Convent bridge all the way up until 1993, which is when the US 81 designation was truncated to Ft. Worth.